PopCap's popular game Plants vs. Zombies HD for iPad and iPad 2 is on sale right now for $1.99 (iTunes link). PvZ, as it is often referred to, is normally $6.99. If you haven't played before, the premise is that you control a variety of plants and mushrooms to stop the zombie horde that is invading your yard from the cemetery across the street. Oh, and your neighbor, Crazy Dave shows up every now and again to sell you more seeds and other important upgrades. 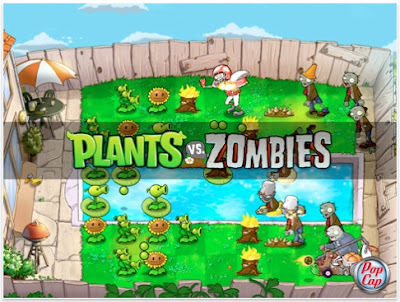 The best part of the game, for me anyway, are all of the wonderful plants and things in your zombie busting arsenal. It's hard to look cute and slightly irritated all at the same time. Sounds weird, I know. Until you play it. My kids and I started off playing the web version, and I decided that we like the game enough to buy the Mac OS X version. For a while there, I was super addicted to the game because I wanted to make it all the way to the end of the game and not get stuck on a tough level. PopCap also has a version of PvZ for the iPhone/iPod touch for $2.99 (iTunes link). You can also purchase the Mac OS X version from the Mac App Store for $9.99 (App Store link) or, if you're on a Windows PC, you can purchase the game directly from the PopCap website.